One of my friends is starting a school! How amazing is that? I have known Lei for about 6 years and she is an amazing lady. 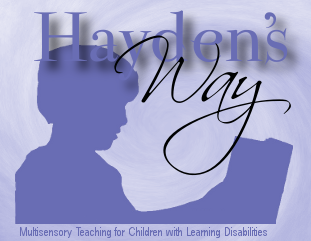 She has a son who is a high-level functioning autistic, Hayden, and after one thing leading to another has begun a school for children with learning disabilities. I have been privileged to watch this school turn from a dream into a reality and have witnessed first-hand God’s awesome providence at work. This is an amazing school. The concept is amazing. The teachers are amazing. The curriculum is amazing. What a blessing for these kids who need it. With all of Lei’s other responsibilities in starting the school and becoming accredited, she decided to turn over some of the literature design to me. I have designed a brochure, letterhead, fundraiser invitation and I have reworked the first draft logo. I have thoroughly enjoyed working on the materials for this awesome venture and hope that this school will be a tremendous blessing for the families involved. I hope that you will visit the school’s website and think about helping out in some way with Lei’s labor of love. Click on the brochure cover to download a PDF of the brochure. 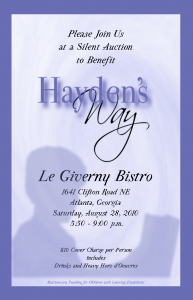 Click on the invitation for the information on the Silent Auction to benefit Hayden’s Way.